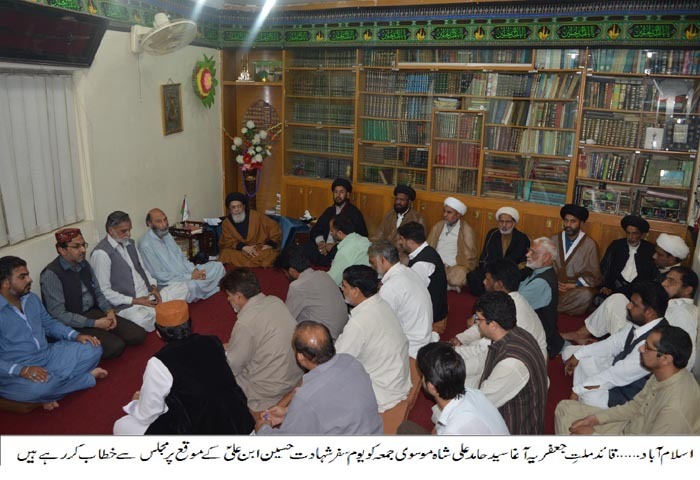 ISLAMABAD, April 6: he Patron in-Chief of Supreme Shia Ulama Board and Head of Tehreek e Nifaz e Fiqah Jafariya Agha Syed Hamid Ali Shah Moosavi has urged the rulers to expose heinous Indian atrocities to the world rather than attempting to defame and defeat each other. They must focus upon getting the disputes of Palestine and Kashmir resolved in accordance with the aspirations of the Palestinian and Kashmiri people and the resolutions of the United Nations for the sake of lasting peace in the Middle East and South Asia. India is exerting all her force to convert Muslim majority into a minority in the occupied Kashmir and trying to eliminate article 35-A which ensures that a Non-Kashmiri cannot own land in the occupied Kashmir. India has been the facilitator and stooge of the evil powers on religious and regional basis whose ugly face has exposed. Pressure to resolve Kashmir dispute in accordance with the UN resolutions is mounting on India with every passing day and she is using terrorism and cease fire violations against Pakistan to divert attention from the core issue of Kashmir and yesterday’s martyrdom of three Pakistani soldiers is part of the series. The spirits of the people of Kashmir is rising despite all Indian atrocities. The strong faith of Hazrat Imam Hussain Ibn e Ali (A.S) and his companions on Tauheed-Khudawandi i.e. oneness of God, is the eternal lesson of Karbala where they practically proved that in a fight of right and wrong, the numeric value is not important and that is why the eternal victory of Imam Hussain’s companions seventy two companions against the hundreds and thousands of Yazeedi soldiers has been a source of astonishment and surprise for the world of humanity. For centuries, human beings have loved courage, bravery, character elevation, chastity of hearts, and spiritual courage and power and it is the reason that the people following the righteousness never submit to the atrocities and suppression and do not compromise on justice and freedom and the same secret lies behind the greatness of the holy Prophet”s grandson Hazrat Imam Hussain. He said this while addressing to the Majlis on Friday held in connection with the Youm e Safar Shahadat i.e. the first day of Imam Hussain’s (A.S) journey to martyrdom. On this occasion he also announced to observe Hafta e Wila e Muhammad o Aal e Muhammad from 1st to 7th of Shaban al Moazzam. Agha Moosavi noted that the freedom movements of Kashmir and Palestine have been exposing Indian and Palestinian atrocities in the whole world. Therefore, according to a report of BBC, despite so called Indian claims of a surgical strike Indian political control on the occupied Kashmir is weakening. He said that Indian secret agency RAW’s involvement and support to the terrorist attacks in Pakistan is known to everyone and its biggest proof is the capture of Indian spy Kulbhoshan. He said that eight lac Indian soldiers in the occupied Kashmir are targeting Kashmiris through pallet guns and arresting thousands of their men and women. Consistent curfew is imposed in the valley, the businesses have fallen, food items are unavailable, educational institutes are closed, Indian army is cordoning off the settlements and committing atrocities against innocent civilians therefore, the so called champions of human rights must play their due role as Kashmiris have been protesting against Indian occupation since 1947.